the model years inclusive are collectively known as the SERIES II RX-8...and includes the marketed name of the R3. While these files are MNAO Dealer issued, most detail is the same for all countries, however obviously some 'electrical features' differ between other countries. As does some mechanical between Left Hand Drive and RHD units. This PDF File size for is considerable @ 53 Mb, please ensure you have the latest and updated PDF ADOBE Software up and running. I suggest you click on link (below) and once fully downloaded click on (in) your Adobe "File" 'Save As'. There are over 4,150 pdf pages which are indexed and search-able for your viewing pleasure. 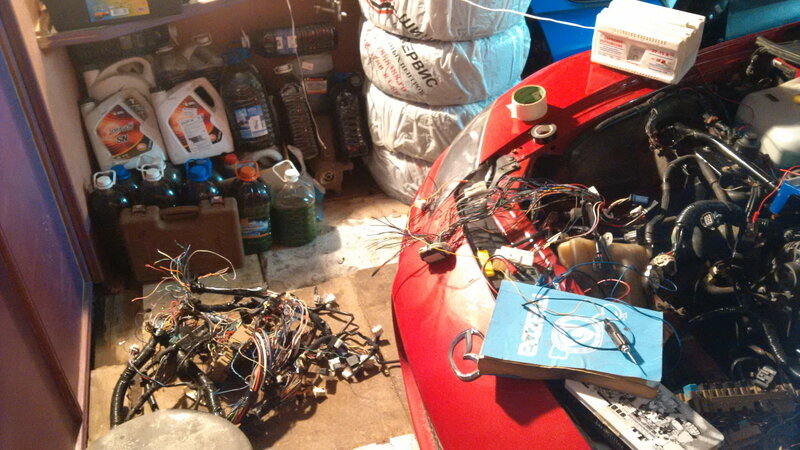 with a generic 'code reader' along with Mazda's suggested repair procedures . together with a separate VCI or VCM (Vehicle Communication Module) Pass-Through Device and with a suitable MS Windows PC. with a very large number of mechanical and electrical upgrades between the two Series none can be realistically cross referenced or used. This link below has the Series II Wiring Diagrams SET which will require to be un-zipped (41.7 MB) before use. This is not for Series I (2004-2008 RX-8). Works best on IE (Internet Explorer) only..
Once you have unzipped file to a location on your PC you will have a folder (Mazda RX-8 Series II Wiring Diagram). Full of HTML, GIF and PNG Images. This is how this set must remain. To view the wiring Connectors/Plugs/Fuses use the 'complist', and also click on connector icon (far right) associated with each electrical component listed. Each wiring diagram shows coloured layout for wiring (code colour) to relevant modules or components. and where Power flows and Ground (Earth) path to a component (interactive). PINK COLOURED LINES INDICATE UNSWITCHED BATTERY POWER PATHS (Can actually look light brownish/beige). GREEN LINES INDICATE GROUND (Earth) PATHS. Voltage/Resistance information is also displayed on some pages (Light Blue 'thought bubble'). of all 3 pages associated with what you are viewing. 1. Wiring layout in colour, the 2. Harness Connector(s) layout, the 3. Harness Routing and Connection Locations associated with your selected interactive view. THE DESIRED COMPONENT OR ISSUE AND USE THE COPY WHILE TESTING WIRING, CONNECTOR PLUGS, OR POWERED DEVICE. * Depending on your PC settings you will get an ActivX pop up alert. Check “Allow active content to run in files on My Computer”. Thank you so very, very much for this, lol. Seriously, this is awesome. The interactive wiring diagram is really cool - sure beats tracing through paper charts all over the place. Chrome's flash player did not want to cooperate without being hosted by a local web server, but that wasn't an issue for me and IE/FF may not have that problem with the right security settings. I can't beleive I've only just found this. Thanks ASH8! Can you help me - have some body electric manual fo Fe3s ? Problem in different ECU blocks and wires. You put a series one engine in a series two car!? Well you're going to have to address a lot of things, in fact you should probably make your own thread to have people go over everything you'll need to do. Off the top of my head, your going to need to work on the OMP somehow, use the series one ecu or devise your own solution. No, engine (R3) with self ECU, need body electric manual for connect ECU R3 to body system se3p. Mate, everything is different in electrics, control modules, EMOP's, looms, nothing will just swap over easily. Perhaps you should have read the threads posted here long ago. I really doubt you will find a comprehensive enough wiring plan/diagram, I and others have posted before and are only really detailed at module end/plug, but as I said the wiring looms on S2 (R3) are also different coloured and different plugs to different modules under the Dash and Engine bay side. An S1 ECU wont fit as the connections are totally different, plus 2x EMOP's wont work off S1 MOP wiring. You will have to work this a lot, frankly I would try bypassing Mazda wiring and installing an aftermarket like Motec systems, and pre-mix, maybe? Hi all. Regarding the Series II Wiring Diagrams SET link above, it appears to be dead. Could someone repost a working link? Thanks. Bump, looking for anyone that can rehost the electrical info. Can anyone re post this please? In for a new link as well ! thanks! THIS IS ONLY FOR 2009-2011-12 Series 2 RX-8. Holy moly. Just played around a bit with the wiring diagrams. These are the coolest ever. Mazda spent some serious time on this! Last edited by acroy; 04-29-2016 at 09:09 AM. Thank you so very much for reposting this!! No problem, I did not realize the link was dead.. I was wondering if anyone had the parts manual for the Series II (R3). Here is an example of what I am looking for. This would make things so much easier. If there is another way to see an exploded parts list, that would work too. Yes, that would be great to have for the Series II! This has come in handy so many times, thanks! !